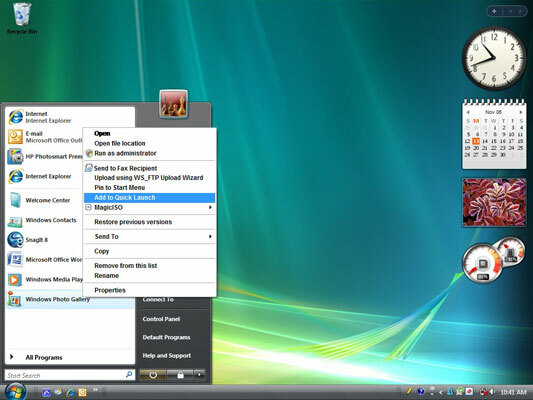 The Quick Launch bar in Windows Vista allows you to open programs quickly, but not all programs you’d like to launch may be located on the Quick Launch bar. To make sure your most-used and favorite programs are on the Quick Launch bar, you just need to add those programs to it. Just follow these steps and you’ll have all of your most often used programs lined up nice and neat on Vista’s Quick Launch bar. 1Locate the Quick Launch bar. It’s on the taskbar just to the right of the Start button. Right-click the taskbar and choose Toolbars→Quick Launch from the shortcut menu if it is not visible. 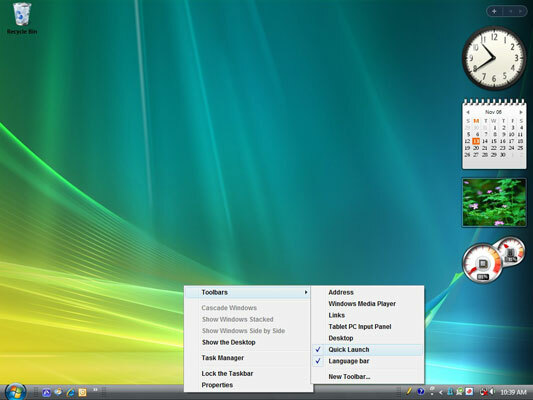 By default, the Quick Launch bar includes the Show Desktop and Switch between Windows icons. 2Place any application on the Quick Launch bar. Right-click the application in the Start menu or on the Desktop and then choose Add to Quick Launch. You can also click and drag the application to the Quick Launch bar.